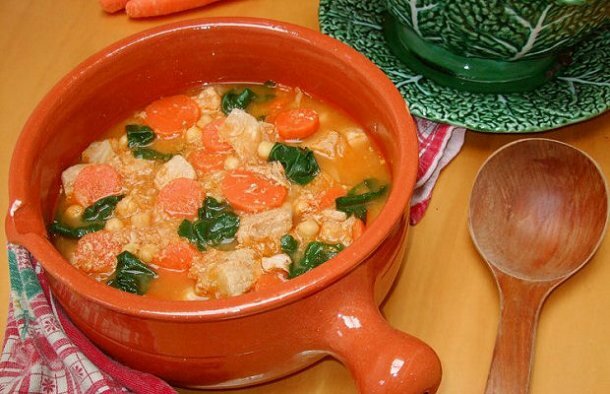 This easy to make Portuguese pork with chickpeas Soup Recipe (carne de porco com grão de bico) is super delicious. Cut the pork loin into cubes. In a pan with some olive oil over medium heat, add the onion, the garlic, the bay leaf and the chili pepper. Once the onion is translucent, add the meat and let it cook a little. Then season with the salt and add the paprika, the tomato and mix well. Next add the wine and let it evapurate a little, then add the water and let it cook a little. When the meat is almost cooked, add the carrot and the chopped cabbage and let it cook for 10 minutes. After the 10 minutes, add the spinach leaves, mix and turn off the heat leaving the pot covered so that the vegetables finish cooking. Finally add the chickpeas, mix well and serve. 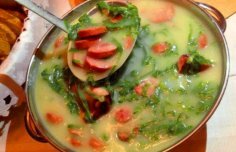 A delicious, popular Portuguese soup done in no time for you and family to enjoy. How to make Portuguese chestnut soup. This hearty and nutritious Portuguese lentil and chickpea soup is very rich in flavor and perfect for any occasion.